Leicester (pronounced Lester; pop. 284,000, with the suburbs 330,000) is one of England's most multicultural city. In fact it has the highest percentage (37%) of non caucasians of any city in the UK, including 30% of South Asians and 3% of Afro-Caribeans (mostly Ugandans). Leicester was badly damaged by German bombings during WWII, but is now redefining itself as a vibrant and modern city, where mosques, Hindu, Jain and Sikh temples are giving it a new appearance. The Indian and Pakistani community is concentrated along Belgrave Road and Melton Road. 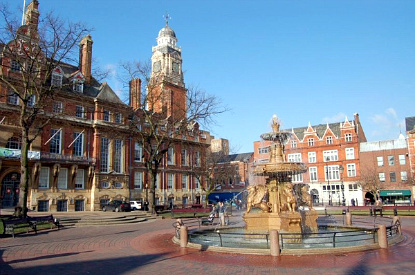 Try to visit Leicester during one of its two great Hindu festivals. Diwali , the Festival of Light, is held in October or November and attracts some 20,000 onlookers. Also in October, Navrati (festival dedicated to goddess Ambaji) is celebrated during nine days. The Afro-Caribbean community also has its own festival, second only after Notting Hill's carnival, during the first week of August. Leicester was founded in 50 CE as the Roman trading and military settlement of Ratae Coritanorum, upon the Fosse Way (main road running between present-day Exter to Lincoln). It is believed that the name Leicester is derived from Ligore Caster, meaning "castle on the (River) Legro, from the former name of the River Soar that flows through the city. Resetlled by the Saxons after Roman times, Leicester was taken by the Danish Vikings and became one of the five boroughs of the Danelaw. Although Leicester was at both the status of 'city' and 'diocese', by the 11th century it had lost both of them and was not to recover them until the 20th century. In 1265, Simon de Montfort, Earl of Leicester, forced King Henry III to hold the first parliament of England at the now ruined Leicester Castle. Leicester turned into a major industrial city after the construction in the 1790s of the Grand Union Canal between London and Birmingham. This was further accentuated with the coming of railway in 1832. The city's main industries are hosiery, footwear and engineering, but all declined sharply after WWII. Leicester is also famous for two 'unusual' citizens. The first one was Daniel Lambert (1770-1809), who reached the record weight of 333kg, making him the heaviest man of his time. The second was Joseph Merrick (1862-1890), the 'Elephant Man', who suffered from an extremely rare genetic disorder known as neurofibromatosis, expressed by a grotesque deformity. Joseph spent much of his life in as a circus attraction. The biographical book Elephant Man: A Study in Human Dignity by Sir Frederick Treves was made into an for Academy Awards winning movie in 1980 starring Anthony Hopkins. The city centre is mainly Victorian, with the Clock Tower of 1868 acting as the main landmark, at the intersection of High Street, Churchgate, Belgrave Gate, Humberstone Gate, and Gallowtree Gate. 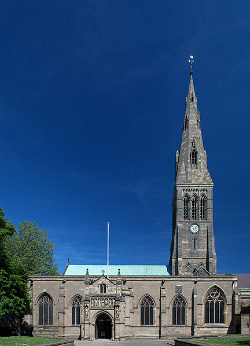 Also worth mentioning is St Martin's Cathedral, originally founded in the 11th century. Leicester can pride itself on having the only Jain Temple outside the Indian subcontinent. A disused church was converted into this Jain centre using materials shipped from India. One of the most popular attraction is the National Space Centre, the largest of its kind in the UK. It has great exhibition about space, rockets and planets, as well as a domed Space Theatre. Leicester's museums (open Mon-Sat 10am to 5pm, Sun 1pm to 5pm; until 4pm from October to March) are all free, so do not hesitate to visit them, especially that there are quite good and there is not much else to see in town. First on the list is the New Walk Museum digs into the meaning of biodiversity, exhibits dinosaurs skeletons and Egyptians mummies, and the newly opened section on World Arts even has loaned items from the British Museum and Victoria and Albert Museum in London. 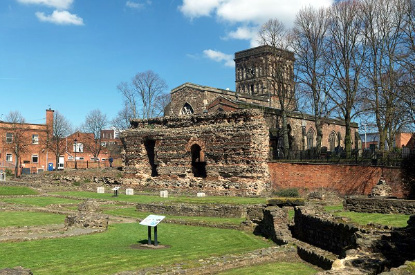 The Jewry Wall Museum investigates Leicester's Roman past. The remains of the Roman baths is the largest surviving Roman building in England. The Newarke Houses Museum is made up of two restored 16th-century buildings and has various displays, including an exhibition about Thomas Cook and Daniel Lambert (see History above). In the same lines, the timber-framed Guildhall dates back to 1390 and has a reputation for being haunted (murderers were executed there). Leicester is located between Nottingham to the North, Northampton to the South, Birmingham to the West, and Peterborough to the East. The M1, M69, A46 and A47 motorways all pass through by Leicester. Trains run between Leicester and London St Pancras (1h10min to 1h30min, £30 super advance single), Nottingham (1h, £5.70) and Birmingham (50min, £7.20). National Express has coaches to London (3h, £19) and Birmingham (1h, £6.50). Express bus No 777 runs to Nottingham (1h, £3.50) and No X67 and 157 to Coventry (1, £3.50).